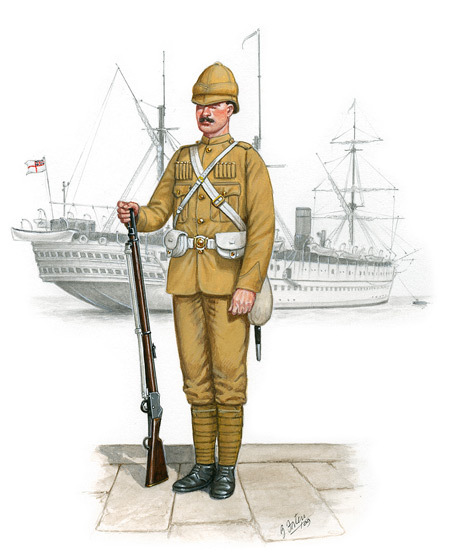 Soldier of 2nd Bn The Queen's Royal West Surrey Regiment, Burma. Once Britain started to gain possessions overseas, it became necessary to provide them with garrisons, and the troops involved had to be transported in ships. As the Empire expanded in the eighteenth and nineteenth centuries, so the need for peacetime "trooping" in ships grew to be a major activity experienced by most Regular soldiers, much expanded in times of war, of course. Although air transport played a vital role in the Second World War, it was not until the late 1950's that the development of large passenger and cargo aircraft started to make possible the routine transport of large bodies of troops and their equipment by air; ironically, Britain was by then in the process of withdrawing from most if her overseas territories. This Section tells the story of the Regiment's experiences of trooping by ship. ‘Ere’s September come again – the six-year men are free. To where the ship’s a coalin’ up that takes us ‘ome to-day. For we won’t come back no more. As a time expired man. An’ the time-expired’s waitin’ of ‘is orders for to sail. But the time-expired’s waitin’ of ‘is orders ‘ome to-day. But damn the chills and fever, men, we’re goin’ ‘ome to-day. Troopin’, troopin’, troopin’ winter’s round again! What’s the last from Lunnon, lads? We’re goin’ there to-day. “Ere’s to English women and a quart of English beer. Gawd’s mercy strike ‘em gentle –Whoop, we’re goin’ ‘ome to-day. Our ship is at the shore.